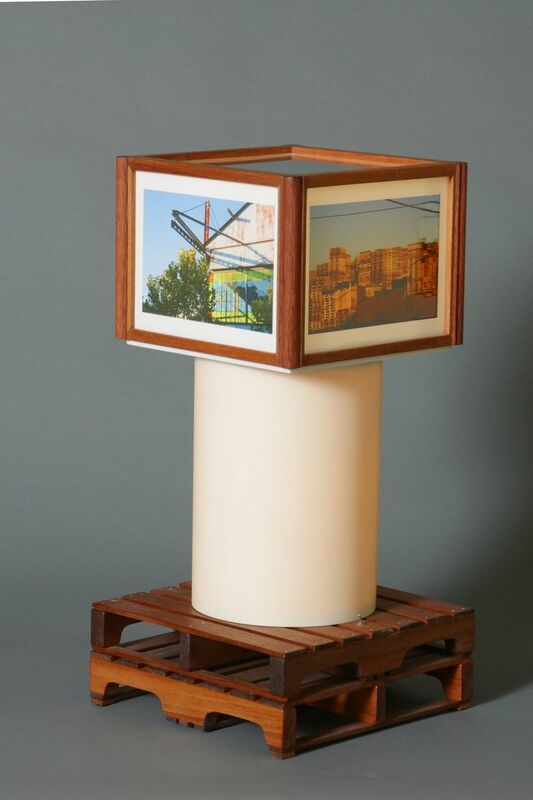 Mahogany, Rosewood, PVC, plexi-glass, photography (by artist), lamp parts. The photos in this lamp were taken in my neighborhood in Oakland. Some of the photos illustrate one of the local industries-- refurbishing shipping palettes, and the base of the lamp consists of two miniature palettes made of Mahogany. The lamp has a different photo on each side, as well as, one on the top of four planes flying in the sky. There are two lights (both fluorescent bulbs) that are independently controlled. One in the PVC tubular middle of the lamp which gives off a warm yellow glow, and one in the top shade behind the photos. The photos are printed on special light emitting plastic-like paper designed specifically for lamp shades, which also allows the photos to be visible without the light on. I made two of these lamps, as a pair, with different photos in each of them. They are both available.